Wildlife carers say they are struggling with the overwhelming numbers of bats becoming affected by heat stress in colonies in Cairns, Edmonton, Gordonvale, and Townsville. 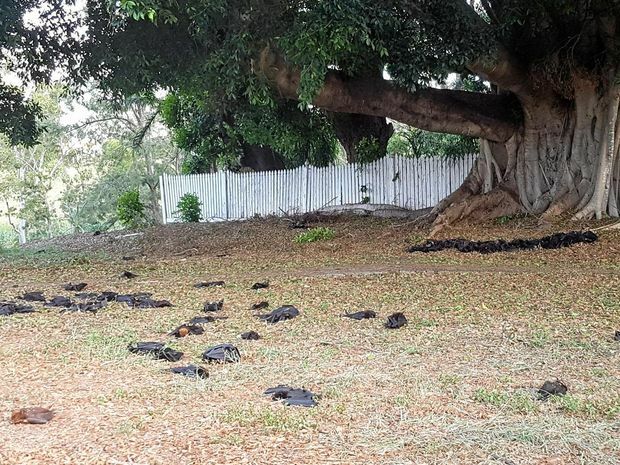 In the Murray St Park in Manoora, Amanda Milligan and Jessie Smart from FNQ Wildlife Carers had set up a “triage” system, administering glucose injections and spraying injured flying foxes with water. Ms Milligan, who has lived in Cairns for more than two decades, said she had never seen so many bats badly affected by the heat. “As soon as it hit more than 40C, we had bats falling from the trees,” she said. She said they were desperate for other wildlife carers and volunteers to assist with either treating bats, or help clear and count the dead. In January 2018, thousands of flying foxes, bats, died in an Australian heatwave so severe it melted tarmac, the temperature reached almost 50 deg C or 122 deg F.
Meanwhile, in February 2017, thousands of dead bats dropped from trees after temperatures topped 47 degrees in parts of New South Wales.